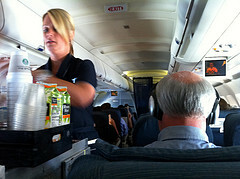 Previous post: How much do flight attendants get paid? I am fly a lot with the “friendly” skies…whoever thinks Flight Attendents don’t work, need to start waking up to smell the coffee…Except for those in armed public service (police, firefighters) or health care pros, I don’t think I see other proffessions work as much or have to know and be prepared for as much as the airline cabin crew…only get to sit down during immediate take off and landing…dealing with snooty and snotty people all day, working and sleeping on the craziest of schedules, working in a place with no escape to walk away or take a breath of fresh air, not to mentionm they can make less then some receptionists, and to actually have a line of work where your knowledge of the job can be the life or death a passenger… Goodness gracious, why did you become a flight attendant again???? Some of us are really, really allergic to the 9-5 routine. I don’t diss people who work in offices. I did it but seeing the same faces every day and the strict routine-it wasn’t for me! No two days as a Flight Attendant are alike. You don’t work with the same people, you don’t (usually) serve the same people and more or less, you don’t go to the same places all the time. Every flight has it’s own challenges and adventures. pay flt att. the money they deserve….